A few weeks ago I wrote about some common Learning Management (LMS) terms you need to be familiar with when preparing to report eLearning data to an LMS. Over the next few weeks, I'm going to show you the LMS setup process in the top eLearning development tools (Adobe Captivate, Articulate Storyline, TechSmith Camtasia Studio, and Trivantis Lectora). Enable Reporting for the project via Quiz > Quiz Preferences. From the Quiz category, select Reporting. From the top of the dialog box, select Enable reporting for this project. From the LMS drop-down menu, choose Other Standard LMS. If your project does not contain a Quiz, from the Status Representation area, select Incomplete ---> Complete; otherwise, select Incomplete ----> Passed/Failed. A project does not have to contain a conventional scoring quiz (with question slides). Instead, you can set interactive objects (such as buttons or click boxes) to report a value/score to the LMS, much like you can by assigning a point value to a question slide. From the Success/Completion Criteria area, select Slide views and/or quiz. If something in your project is worth points (a question slide or interactive object), deselect Slide Views and select Quiz. If you'd like, ensure Quiz is Passed is selected from the drop-down menu. From the Data To Report area, select Percentage if your project doesn't contain a conventional quiz; otherwise, select Points. The LMS Initialization Text field is not supported by every LMS. Anything you type in the field appears just before the lesson begins to play for the learner. In essence, LMS Initialization Text serves as a second lesson Preloader. You can edit the text, if you'd like, or leave it set to the default (Loading). The Manifest file allows your published Captivate projects to be used and launched from a SCORM 1.2- or 2004-compliant LMS. When you publish projects, you can have Captivate create the Manifest file for you. The Manifest file that Captivate creates contains XML tags that describe the organization and structure of the published project to the LMS. From the top of the dialog box, ensure SCORM 1.2 is selected (from the Standard drop-down menu). Click the Configure button to open the Manifest dialog box. In the Title field, type a name. The Title is seen by learners as they access the course on the LMS. A Description is not required. Depending on the LMS you use, the text may or may not appear in the LMS. If the feature is not supported by the LMS, it will likely be ignored, just like the Title. The Version number, which can be left selected, is used to distinguish manifests with the same identifier. There are two other optional choices in the Course area: Duration and Keywords. Duration lets you show how long it takes to complete the Captivate project. The Keywords option allows you to specify a short description. When the course is displayed via a browser, such as Internet Explorer, the description and Keywords can be searched like any web page. In the SCO Identifier field, type a name. The Identifier, which cannot contain spaces, specifies a name used by the LMS to identify different SCOs. In the Title field, type a title. The Title shows up in the LMS. Although you can use spaces in the Title name, you should consider using short descriptive phrases. If you would like information on the remaining options in this dialog box, click the Help link at the bottom left of the dialog box. Click the OK button to close the Manifest dialog box. Nothing about your project changes physically. However, once the project is published, it will automatically be zipped and capable of communicating with any SCORM-compliant LMS. 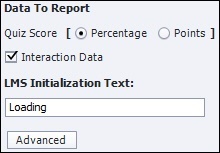 If you're using Adobe Captivate 9, you can utilize the SCORM Cloud to ensure your published Captivate lesson will report scores/data correctly to just about any LMS. I've written about that previously and you can read about it here. Assuming there aren't any reporting issues via the SCORM Cloud, you're clear to prepare your Captivate project for uploading into an LMS. This process is known as creating a Content Package. Simply choose File > Publish) and set up your Publish options as you normally would. Because you Enabled Reporting via the steps above, the Zip Files option is selected by default (which will yield one zip file--the SCORM package). The zip file is what you will physically upload into your LMS. Once the package is uploaded, the LMS will automatically unzip and install the course contents. When developing eLearning, you can elect to use Articulate Storyline, Adobe Captivate, Lectora, Camtasia Studio--there's no shortage of awesome tools. Once the eLearning content is finished, do you need to track learner access to the content? Do you need to provide reports to your boss that show how learners have performed on a quiz? How about letting the boss know how many people have accessed specific lessons, and how many people have completed the course? If you need your eLearning content to report data and have that data stored and available for you to format in a meaningful way, you need a Learning Management System (LMS). Before your project can be used with an LMS, you have to set up some reporting options and become familiar with the following: Sharable Content Object Reference Model (SCORM), Aviation Industry Computer-Based Training Committee (AICC), Sharable Content Object (SCO), and the Manifest File. Over the next couple of weeks, I'll go over the process of preparing your eLearning content for upload into standard LMSs. This week, let's get some important terms out of the way. Developed by public- and private-sector organizations, SCORM is a series of eLearning standards that specifies ways to catalog, launch, and track course objects. Courses and management systems that follow the SCORM specifications allow for sharing of courses among federal agencies, colleges, and universities. Although SCORM is not the only eLearning standard (AICC is another), SCORM is one of the most common. There are two primary versions of SCORM-version 1.2, released in 1999, and version 2004. During this series, you will prepare and then publish a project to a SCORM-compliant LMS. AICC is an international association that develops guidelines for the aviation industry in the development, delivery, and evaluation of training technologies. When you publish your Captivate projects, you can specify SCORM or AICC compliance, but not both. Not sure which one to pick? Talk to your LMS provider for information on which one to use. When in doubt, consider that AICC is older and more established than SCORM, but SCORM is the standard most often used today. Today's learners are consuming eLearning content using a vast array of devices (PCs, Macs, and mobile devices, such as the iPad). And learners are working outside of traditional LMSs. In spite of these challenges, educators still need to capture reliable data about the learner experience. The problem with data collection is that you need an expensive LMS to store the data. And your learners need live access to the LMS so that they can send the data. As mentioned above, the most widely used LMS standard for capturing data is SCORM. SCORM allows educators to track such things as learner completion of a course, pass/fail rates, and the amount of time a learner takes to complete a lesson or course. But what if a trainer needs to get scores from learners who are collaborating with other students using social media? What if the learners don't have immediate access to the LMS? The new Tin Can API allows training professionals to gather detailed data about the learner experience as the learner moves through an eLearning course (either online or offline). According to the Tin Can API website, "The Tin Can API (sometimes referred to as the Experience API) captures data in a consistent format about a person or group's activities from many technologies. Very different systems are able to securely communicate by capturing and sharing this stream of activities using Tin Can's simple vocabulary." If the Tin Can API is supported by your LMS, you'll be happy to learn that it's also fully supported in most of today's eLearning development tools. Sharable Content Objects (SCOs) are standardized, reusable learning objects. An LMS can launch and communicate with SCOs and can interpret instructions that tell the LMS which SCO to show a user and when to show it. Why should you know what an SCO is? Actually, your eLearning projects are SCOs once you enable reporting (which you will learn how to do next time). Picking a Learning Management System (LMS) to host your eLearning content is a crucial, but often overlooked, step in the eLearning development process. The problem is, there are several LMS vendors from which to choose. Which LMS fits best within your budget, your eLearning development software, your learner's technology, your training objectives, and your instructional design initiatives? Purchasing an LMS is a big decision for any organization. In fact, you'll find that the price for an LMS can range from free to $1,000,000. The first step in picking an LMS is knowing your organization. An LMS can be used for a variety of different tasks--internal training, performance tracking, compliance maintenance, policy awareness, and employee feedback. Ask the executive team what requirements they might need from the solution. Do you need the LMS just for training? Could the LMS be used for new employee orientations, site-specific safety training, internal policy management, and sign off? Identify the level of maintenance and internal staff that will be required to implement and maintain the service. Some systems are very easy to setup while others can require months to properly set up. Ensure you are aware of which one you are getting. When pricing an LMS, keep in mind that the number of users who will access the LMS will likely affect your licensing costs. One of the biggest factors that will influence your LMS choice is the content you'll be uploading into the LMS. Some eLearning courses use video, others use written materials. Things like file format (Flash vs. PDF, PowerPoint vs. Spreadsheet) can make a difference in what systems are a potential fit. Does the system accept SCORM courses? If so, what versions? Will the LMS work if learners are using tablets and mobile devices? Does the LMS support HTML5 versions of SCORM? Some organizations already have training programs and background material; others need to start online course development from scratch. Be sure to ask beforehand what sort of authoring tools the LMS is compatible with, as it is recommended that you find a system that works well with all the leading tools like Adobe Captivate, Lectora, and Articulate Storyline. Training management software may often be advertised as user-friendly, but each system has technical requirements that invariably affect deployment. Check to see if the system offers an API (automated program interface) or SSO (Single Sign On) that complies with your existing systems. These communication protocols affect the exchange of information between your LMS and other programs, like payroll. The final step in assessing which LMS is right for you is implementation and maintenance. Permissions, level of maintenance, and ability to make changes on-the-fly can all affect the cost of LMS implementation and the staff resources required to administer online learning courses. Some systems, like open-source LMSs, may seem attractive because of low costs and easy customization, but they can be more complicated to use than software services that make support staff available. If you're frequently troubleshooting or making system adjustments, the money saved by using a free service can quickly be lost in maintenance hours. Commercial training management software may be pricier than open-source systems, but they are turn-key ready and frequently have dedicated staff to walk your administrators through maintenance and implementation issues-well worth the expenses. Perhaps your organization's learning requirements are seasonally variable? In this case, it may be best to choose a Software-As-A-Service LMS. These services allow you to define your service periods and store information on external servers giving you the external staff and storage resources to manage any required changes to course delivery. Many of the best LMSs provide free trial periods and open contracts to allow you to confirm that they work as advertised without locking you into heavy service fees. Knowing your system, content, and staff requirements will play an important factor in streamlining LMS selection. Knowing your organization and system requirements will knock out most of the hard work that goes into creating a request for proposal. This means your organization can more quickly begin the demo process and start sampling the many LMSs out there without the worry of encountering technical snags late in the selection process. Looking to get started with eLearning? Check out our 3-hour mini courses.